The AirCurve 10 VAuto represents the latest evolution of advanced auto-titration technology and is the logical successor to ResMed's highly successful S9 line of VPAP machines. Featuring a sleek new design that easily blends in with your bedroom's decor, the AirSense immediately gives you a better bedside view of the color LCD display by placing it at an angle rather than flat as with the S9 series. The AirSense also offers built-in heated humidification with ResMed's tried-and-true HumidAire heated humidification system in a package that is nearly 25% lighter than the previous model. As with the S9 platform, you also have the option of the standard SlimLine breathing tube, or the ClimateLine Air heated breathing tube to maximize the effectiveness of the humidifier without the annoyance of rainout. The AirSense shares the S9's whisper-quiet operation with the same highly refined Easy-Breathe motor to power the machine. The AirCurve 10 VAuto devices have been designed to make therapy easy. With no complicated settings or menus to navigate, simply press Start and you're ready to go. The new AutoRamp feature with sleep onset detection helps make therapy comfortable from the moment you turn on your device. AutoRamp works by delivering a low pressure to help you fall asleep with ease. Once it detects you're asleep, it comfortably increases the pressure to ensure your prescribed level is delivered the moment you need it. No need to hit the ramp button multiple times when trying to fall asleep. If preferred, the machine can be set with a traditional ramp setting, or this feature can be disabled altogether. Advanced AutoSet algorithm tailors the therapy pressure to the patient's needs by monitoring their breathing breath-by-breath. 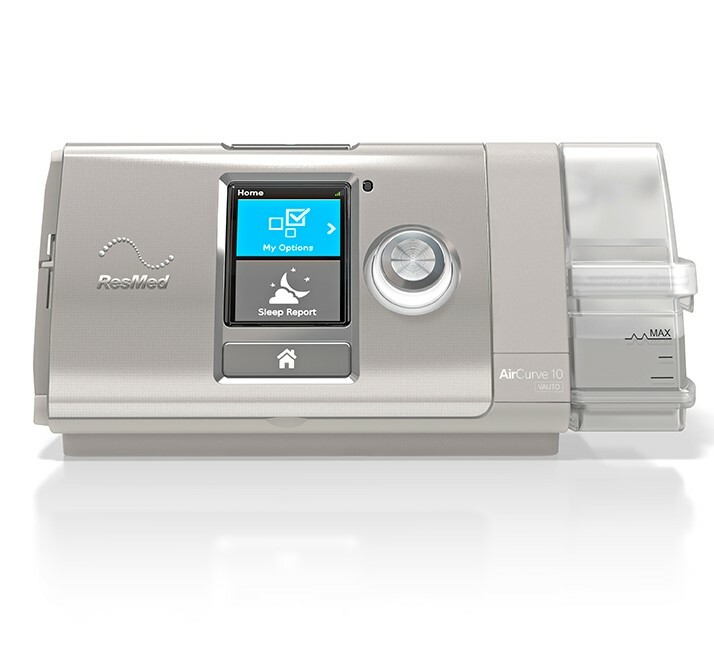 AutoRamp starts the machine at lower, more comfortable pressure, and gradually ramps up to prescribed pressure when CPAP senses that you are asleep. HumidAir heated humidifier is built-in so you can enjoy the benefits of humidification in one easy-to-use system. If you want to travel light with no humidifier chamber, you can purchase the optional AirSense Side Cover and snap it in place of the chamber. Optional ClimateLineAir heated tube ensures effective delivery of humidified air without rainout. Super quiet Easy-Breathe motor ensures a peaceful night's sleep without the incessant whine of a noisy bilevel machine. MyAir™ online patient support program provides helpful information and support during every stage of your treatment journey. By giving you access to your therapy data, it lets you continually track your progress and see how well you're doing.